Sal Masekela backs Kickstarter campaign with Mami Wata and Waves for Change to raise funds for Liberian surf club. African surf brand Mami Wata has teamed up with Surf Therapy organisation Waves For Change to raise funds and build a clubhouse for their programme in Harper, Liberia. 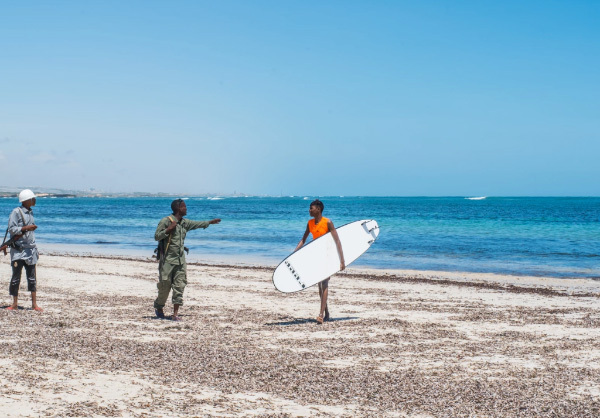 Fronted by celebrated surf personality, journalist and musician, Sal Masekela, the initiative will provide the surf club, called the ‘Harper Sliders’, with a safe place to meet and run their surfing and skills training programmes. To celebrate and drive fundraising for this campaign, Mami Wata has created a limited-edition ‘Harper Sliders’ capsule collection ranging from humble ‘Membership’ postcards, to exclusive apparel and hand-crafted surfboards and skateboards that can only be purchased through supporting the Kickstarter. Mami Wata is a premium African surf lifestyle brand committed to connecting the world to The Power of African Surf. The brand works closely with organisations like Waves For Change to fulfil a promise of being a ‘force for good’ in Africa through design and creativity. ‘Harper Sliders’ is a surf club run by Waves for Change, a world-leading Surf Therapy organisation. Waves For Change works in communities affected by violence, poverty and conflict, where mental health services are often stigmatised and under-resourced, which is the situation in Harper, Liberia. Mami Wata supports Waves for Change’s efforts in improving their lives through the power of African surf. Harper is an isolated town in the South of Liberia. Until recently, the community had never seen surfers or been exposed to surf culture. Since the introduction of surfing and Surf Therapy in 2017, surfing is now booming in Harper. The beach has become a community-owned safe space and more children and adults are getting involved every day. The Harper Sliders Surf Club House will create a focal point for this growing surf community; a shared safe space around which a community can bond, learn new skills and store their equipment. Pledges range from £5, which can get you a collectible ‘Membership’ post card from the Harper Sliders and Mami Wata, to £5000 – which enables two lucky individuals an opportunity to join an 11 day Waves for Change trip to Harper, Liberia with Mami Wata. Mami Wata’s Harper Sliders Club House Kickstarter launches on 04 April 2019 and their call to action is encouraging people to raise awareness and support via donations and shareable content. Homebase is their Kickstarter page, supported by a content suite of video, social media and blogs – all of it engaging and shareable. This entry was posted in Advocacy, Community Building, Events, Latest News, Media, Surf Therapy and tagged Kickstarter, Liberia, Mama Wata, Waves for Change.